This vegetable clothed in crunchy leaves of green has a sea of benefits along with appetizing delicacies. Whether it’s a quick salad, an exciting starter or a main course meal, cabbage can do full justice to all of them. Its availability in the market is not an issue and can be cultivated without difficulties all round the year. Cabbage hails from the brassica family and is a relative to cauliflower, broccoli and brussel sprouts. Before discussing the recipes of cabbage, we would want to shed light on its benefits. Cabbage is loaded with nutritional benefits and can strike a balance on your weighing scale. It’s a delight for calorie-conscious people as the fat content is negligible. It has got the weapons of anti-oxidants and Vitamin C to battle against a host of illnesses. It also aids in enhancing immunity levels thus providing our bodies with the strength to resist the onset of many infections. The rich fiber content in it helps in maintaining a healthy digestive tract. The presence of sulforaphane and I3C compounds elevate the anti-cancer properties in our bodies. Its juice is enriched with anti-aging properties, helps in preventing hair loss and provides a lustrous texture to hair. Thus it helps in boosting up both the internal and external health of our bodies. These are just like the yummy dim sums, except that these are highly nutritious and low on calories. 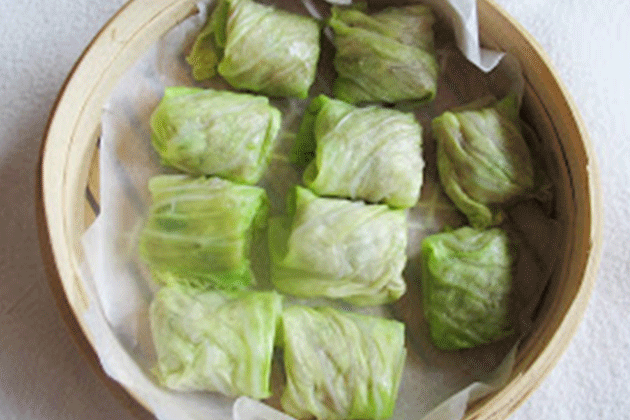 The wheat wrappers are replaced by the cabbage wrappers. Light to tummy and extremely easy to cook, this is a vegetarian recipe from South India. Start the process by heating 1 Tbsp of oil and add 1 Tsp of mustard seeds, 1 Tsp of cumin,1 Tsp of black gram, 1 Tsp Bengal gram, 1 Tsp of asafoetida, 2-3 whole pieces of red pepper and curry leaves(6-7). When the seeds start to splutter add green chilies according to taste. This can be served as a sandwich spread or used as a dip. This is extremely simple to make and will please your taste buds every single time. Start the process by mixing 1 large grated carrot, 1 finely chopped onion, 2 chopped celery sticks, 250 gm grapes, 250 gm of peeled and stoned lichees, 1/2 shredded cabbage, salt and pepper to taste. Garnish with 50 gm of roasted and chopped cashew nuts and desired herbs. Serve cold.